A few weeks ago Mrs. AlbuKirky and I were dining at Sakura Sushi & Grill. We usually order sushi, but sushi is more of summer food and we just weren’t feeling it, so we decided to order something off grill side of the menu. Cheryl had the Bibimbap in a Stone Bowl while I had the Kalbi Beef Ribs. After eating our salad and meso soup waiter returns and set this huge plate ribs in front of me, and of course being the gluten that I am, I devoured the whole freaking thing. 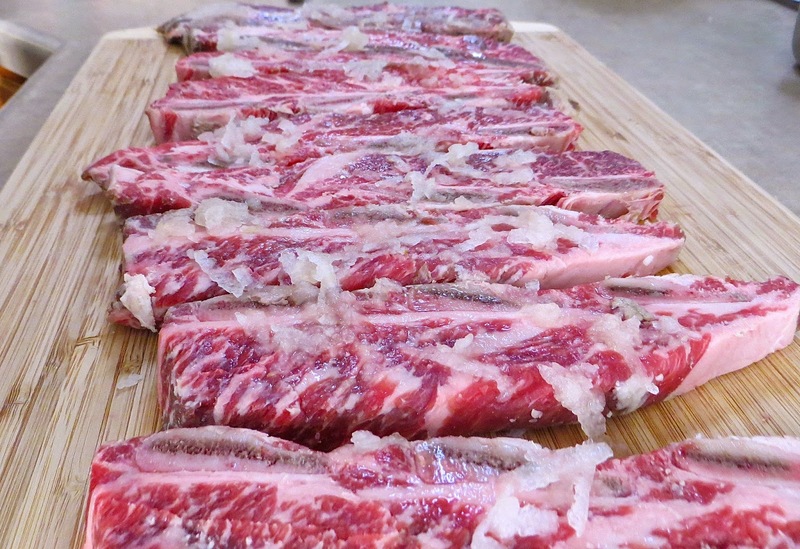 The ribs had a rich beef flavor that was slightly sweet, but it was the umami flavor that totally fascinated me. Umami is one of those flavors that not easy to explain but you know it when you taste it and it tasted really good. I knew after that first bite I was going to have to try to make these at home. 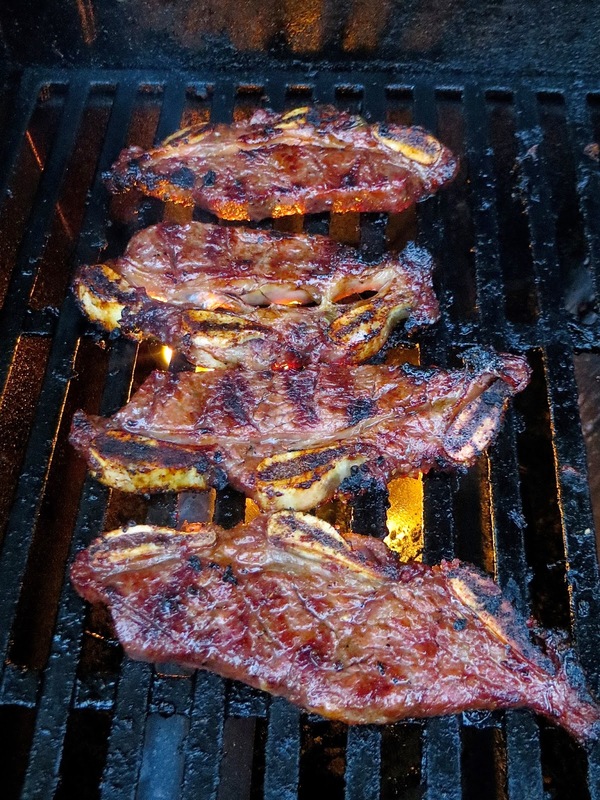 I have made Korean BBQ Ribs before using a store bought Bulgogi sauce. But I wasn’t going to take the easy way out and buy a sauce, I was going to put on my big boy pants and make my own. So I took to the internet to find a recipe. 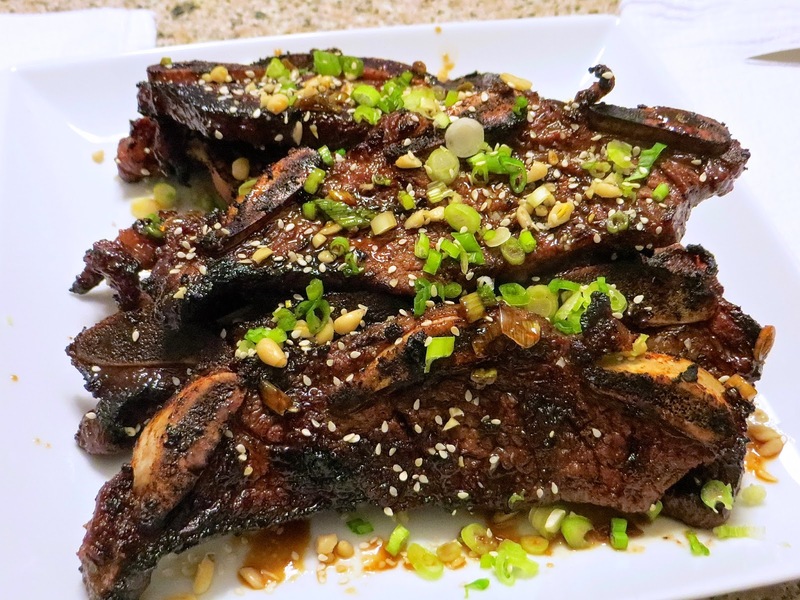 I started looking for a Kabli marinade but I then I ran across a recipe for Galbi Beef at CrazyKoreanCooking.com. These ladies have a great site, I really liked their little recipe app that updates as the servings change. 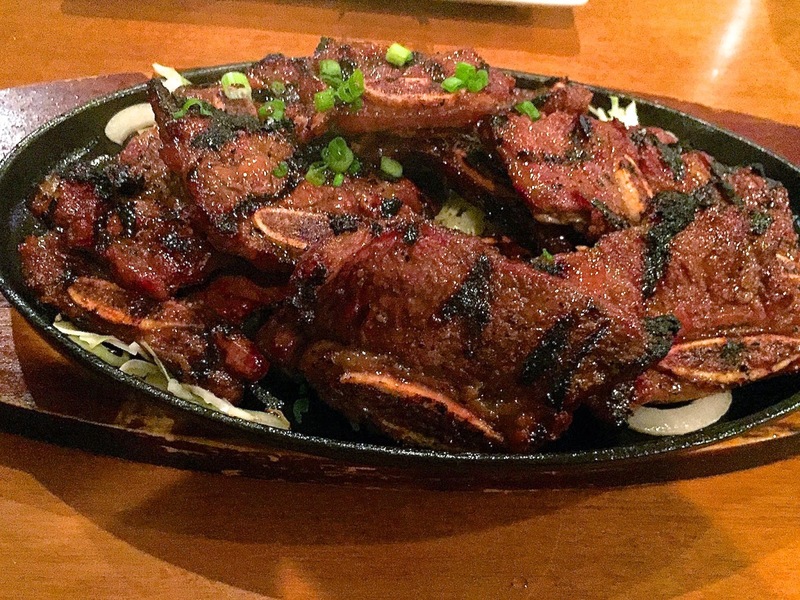 Anyway, the Galbi marinade sounded really interesting, like a cross between the Kalbi and Bulgogi recipes. 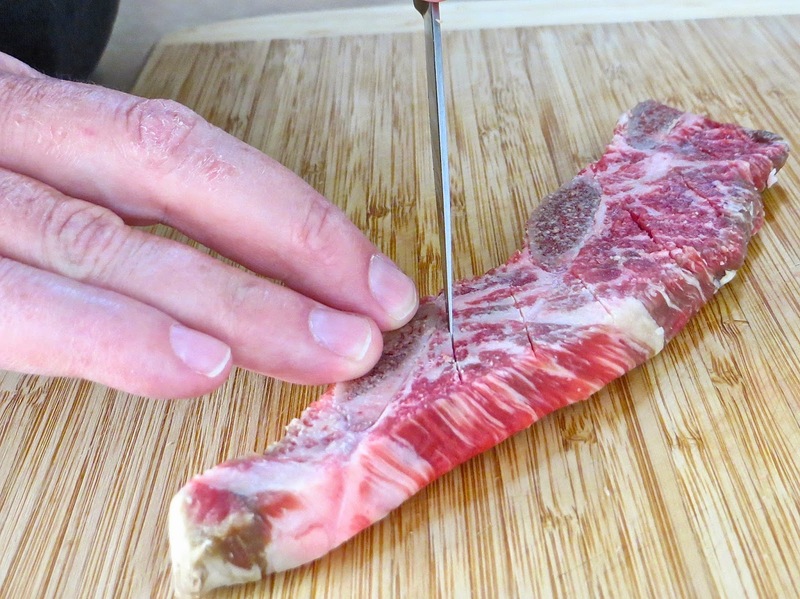 I really want to try their recipe for traditional Galbi Beef Rib, they use the regular cut of beef short rib and then did some fancy knife cuts to make it all pretty. I placed one layer of ribs down in a pan and then poured the marinade over the ribs. I flipped the ribs and really worked the marinade into the meat. I kept building the layers of meat and marinade until I had used it all. 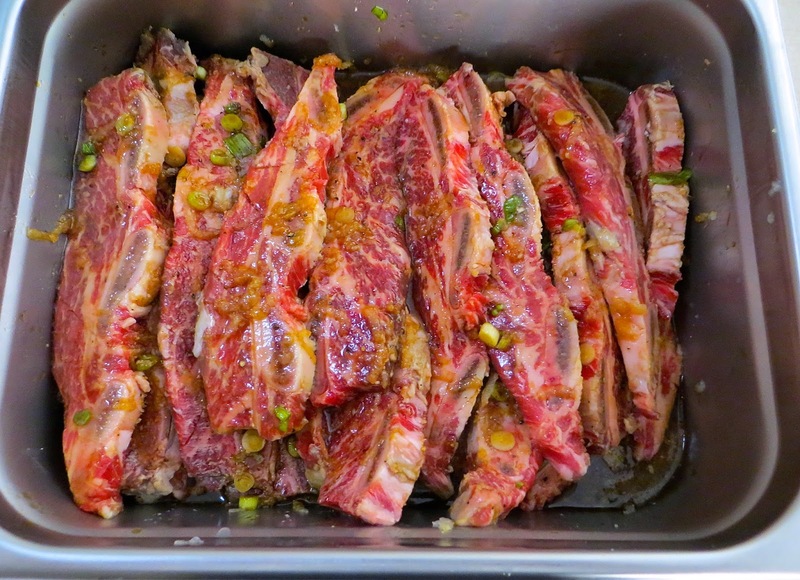 Oh, be sure to set aside some of the marinade to serve with ribs. I placed the pan of ribs in the fridge to marinate overnight. Well, I couldn’t cook the ribs the following night because it was raining. It was one of those rare occasions that it actually rained in NM. Which probably turned out to be a good thing because it gave the marinade another 24 hours to do its thing. So I flipped the ribs around in the marinade and let them sit in the fridge for another day. Since I had so much flavor invested in my sauce I decided to cook these on my Weber gas grill. There was also a good bit of sugar in the marinade and I didn’t want to burn it so I heated up the grill to a med heat about 400-450. I filled the grate with the ribs and left the lip up while I was grilling. I cooked the ribs for about 3 minutes, flipped, and brushed the hot side with some of the marinade. I repeated the flipping and marinade until the ribs had a light char and the dark color I was looking for. Total cook time was 12-15 minutes. 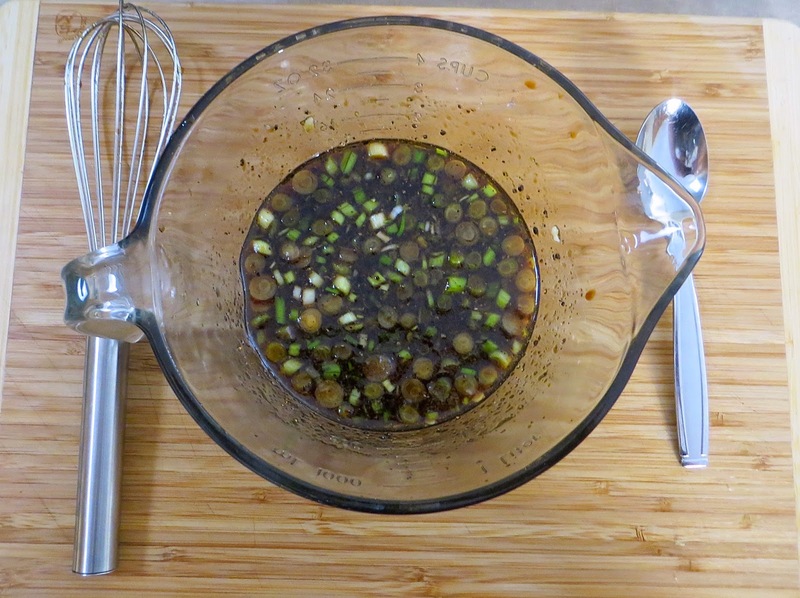 Once the ribs were all cooked I served them with a garnish chopped pine nuts, green onions and a drizzling of the sauce. Now it was time for the moment of truth, eating! UMAMI these ribs were good! They were sweet and savory with just a hint of the onion. Crosshatching the ribs had allowed the marinade to really penetrate the meat so each bit was just packed with flavors. What was really nice was the light sweet crunch of the pine nuts every so often. The only problem with these ribs, they were too good, we ate the entire plate. I hope you all give these ribs a try for yourself, they are absolutely delicious. Maybe my next Asian inspired dish will be the Bibimbap Bow?! Diet Coke: Tasty Beverage or Grill Cleaner?? ?